The way that Camponotus saundersi functions in its environment is quite unique from many other species. It has adapted to its habitat by evolving an enlarged mandibular gland which is used ultimately for protection. 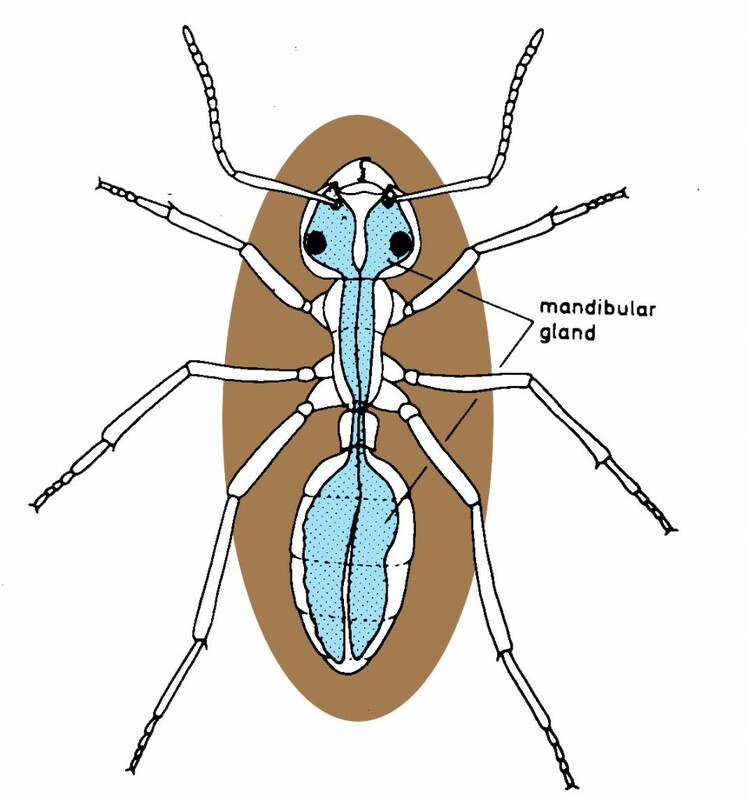 This massive mandibular gland runs from the posterior tip of the ant’s body up through the bases of the mandibles. This gland functions as the manufacturing zone of a specific glue that is to be secreted due to various stimuli, such as predators, that the ant is faced with in its environment (Hoelldobler et al. 1994). This glue is primarily composed of hyrdocarbons, polyacetates and alcohols, and is highly toxic to organisms it is secreted upon (Jones et al. 2004). In battle or contact with a predator, the ant grasps on to the opponents leg or antennae to secure itself to the victim (Davidson et al. 2011).The mechanism used to secrete this toxic glue involves the ant contracting its abdominal muscles to burst open its cuticle, in turn releasing the glue upon the predator (Hoelldobler et al. 1994).Once the secreted glue is sprayed upon the predator, the predator becomes immobilized which is important to the ant and the ant colony for their safety. This is where the common name, “the exploding ant,” comes from, because the ant in essence explodes itself in an attempt to protect its colony (Miner 2013). An important component of glue secretion upon explosion of the ant is not only protection, but the chemicals that are released into the air. Fellow ant nest mates are able to use their antennae to detect these chemicals and prepare for danger. This communication via chemicals is a key evolutionary advantage for this species. Not only do they detect danger, but they can use their antennae to detect changes in the environment, attract other ants, offer food, for nursing anf many other reasons (Miner 2013). This advancement in communication is crucial to their survival and reproductive success (Hoelldobler et al. 1994). Another key component of protection in this species is the presence of an exoskeleton, which is found in all arthropods. The exoskeleton provides protection for the ant’s muscles and soft tissues, as well as providing better leverage for muscles. C. saundersi is mobile by using its six legs and muscular system that is attached to its exoskeleton (McDarby 2014). This exoskeleton must be shed by the ant in order for it to grow (McDarby 2014). In the case of the exploding ant, this exoskeleton can be broken when it contracts its abdominal muscles tight enough to spray glue upon the predator (Hoelldobler et al. 1994). 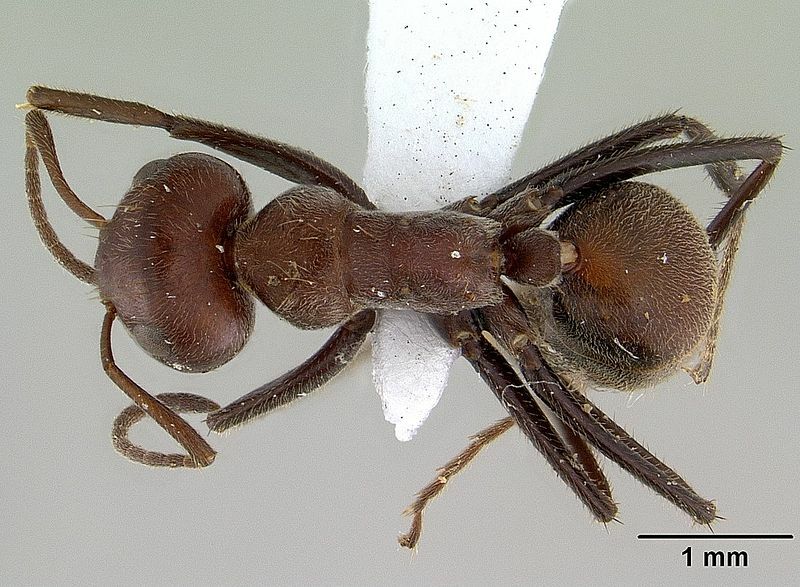 Most ants of the Genus Camponotus, such as the exploding ant, are most active at night. Daylight activity, such as foraging, can occur during the day time but is most often seen during the spring and summer seasons. The worker ants are the ones that do the foraging for the rest of the colony (Pararas-Carayannis 2008). These ants can feed on dead insects, small invertebrates or plants (Jacobs 2014). The worker ants can travel up to 100 yards away from their colonies in order to find food for the queen and the young larvae. When a food source is found, a worker ant will deposit a pheromone from underneath its body to mark the shortest distance back to the nest. This chemical secretion is another means of communication among this ant species. Once the food source has been indicated, other worker ants are able to detect this and follow the shortest distance from the source to the nest. This creates what is called a foraging trail. The foraging trail remains active by the addition of scent from each worker that travels it, and will diminish once the food source runs out (Pararas-Carayannis 2008). When the ant is active during the night, it is protecting itself from coming in to contact with other ant species that are active during the day, as well as other predators that may be hunting them during this time, which is another advantage this ant species has. Check out the reproduction page to see more reasons that chemical communication is important among these organisms!